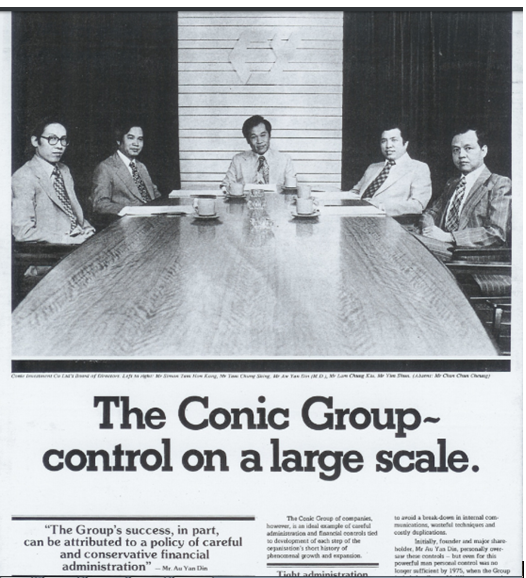 In the late 1970s and early 1980s, the Conic Group (康力集團) under the leadership of its founder Alex Au Yan-din (柯俊文) was the largest electronics manufacturer in Hong Kong which at its peak had annual turnover of over HK$1 billion, over 40 subsidiaries, over 12000 employees (a fact which supports Au’s alleged claim to be the second biggest employer in HK next to the colonial government) and 1.6 million square feet of factory space with plants located in Hunghom, Kwun Tong, San Po Kong, Sai Kung, Shatin, Tuen Mun, Tai Po, Yuen Long and mainland China. It manufactured 30% of all radios, cassettes and digital clocks exported from HK and was also a major manufacturer of electronic components such as plastic casing, liquid crystal display and printed circuit boards. It was a leading maker of television sets computers and video game players and owned HK’s largest TV commercial studio. Financial troubles in the mid-1980s resulted in Alex Au skipping town and the group being absorbed by mainland Chinese interests but some of Conic’s core businesses endured and many of its executives went on to start or head other major electronic companies in HK and China, earning the firm a special place in the history of Hong Kong’s electronics industry. Born in 1938 in Amoy, Conic Group’s founder Alex Au left Fukien and came to HK in the early 1950s. His family was in the tea export business but when the family business failed, he had to drop out of secondary school to work as an apprentice in a plastic factory. At the age of 27 in 1965, he acquired a 900 square feet plastic factory in Hung Hom and renamed it Chee Yuen Industrial (志源實業). Starting with HK$50000 in working capital, 5 injection molding machines and 5 employees, Chee Yuen became the largest manufacturer of plastic casings for electronic products in HK within a few years and had sales of HK$17.8 mil by 1972. With the strong foundation of Chee Yuen, Au expanded into electronics in 1973 and incorporated Cony Electronic Products (康力電子, allegedly named to sound like Sony) with Tam Chung-sing (譚頌聲,?-1994) at the helm to manufacture cassette tape players and radios. The stock market crash in 1973 and economic recession in the mid-1970s became an opportunity for Au who made a series of acquisitions including radio manufacturers and local manufacturing operations of foreign firms who rather outsource manufacturing to Conic than managing their own factories. One of these firms was one of Chee Yuen’s clients – Far East United Electronics (聯華電子, same Chinese name as UMC in Taiwan but no relations). Founded in 1969 by Lam Chung-kiu (林中翹, 1936-), who had previously worked for Japanese and American electronic firms and Chambers Wong Toa-Yuen (王道源, 1939-) at a 3000 sq ft plant in Mok Cheong Street in To Kwa Wan to manufacture radios with less than 100 workers, Far East United was a leading radio manufacturer in HK by 1972 when it moved to its own 11 story industrial building at 171 Hoi Bun Road in Kwun Tong. In 1975, Conic Investment (康力投資) was formed as the holding company for the group and by the end of 1976, the group had paid in capital of HK$52 mil, sales of HK$600 mil (up from $134 mil in 1974 and $214 mil in 1975), 31 subsidiaries, over 10000 employees and 750,000 sq ft of factory space. Employing 300 R&D engineers and 10 sales & marketing specialists, the firm also began manufacturing and marketing globally a series of electronic products such as radio, tape recorders, electronic watches, TV, and answering machines under its own brands such as Conic, Contec (康藝) and Zegna. From electronics, the group diversified into other businesses such as TV commercial production (Conic TV Studio 康力電視, formed in 1976 in partnership with TV producer Robert Chua), video rental (Conic Video Club, formed in 1981), system integration (Conic Business Systems), polyfoam (Worldwide Polyfoam & Engineering) and household/beauty care products (Standard Plastic). It also ventured overseas with foreign affiliates including Conic’s sales offices in the US and Japan, a radio manufacturer in Singapore, a maker of loudspeakers in Taiwan (Yung Cheong), a farm in Indonesia (PT Umas Jaya Farm), a wallpaper company in Thailand (Thai Wallpaper) and a planned joint venture to manufacture TV sets and tape recorders (announced in 1982) with billionaire Lucio Tan in the Philippines. Several factors contributed to the rapid ascent of the Conic empire. First and foremost was Alex Au’s ability to attract and retain talented executives such as Lam and Wong at FEU who stayed on to run their firm as a division of the group which they were minority shareholders of. Another factor was his willingness to spend on R&D and marketing, buying state of the art equipment for every line of business and backing cutting edge technology such as LCD. Vertical integration kept costs down and product pricing competitive. And all this was made possible by access to capital thanks to strong ties to European and American banks and later mainland Chinese banks. Soundic Electronics (聲德電子) – digital clock radios and multiband radios; TV games, formed in 1975, dissolved in 1990. In 1981, the 40 companies within the Conic group were reorganized into two groups – 25 of them split off to form Honic Holdings Ltd (雄力集團), which remained privately held by Alex Au, while 15 of them (including Cony, Chee Yuen and Far East United) remained in Conic Investment which went public in August. This corporate setup would ultimately lead to the unraveling of the group within a few years. The same year, Conic subsidiary Far East United signed the lease for the largest plot of land (225,000 sq ft) at the Tai Po Industrial Estate to manufacture television sets. Profits in 1981 was HK$45 mil but dropped to $32 million in 1982. In February 1983, the Group acquired a new building at 13 Hok Yuen Street in Hung Hom from Cheung Kong as its new headquarters – the Conic Investment Building. Half of the purchase was paid in shares, making Cheung Kong a 7.2% shareholder in the firm. As the production costs soared in HK, Au began looking for lower cost manufacturing base in other locations. With the help of Xinhua News Agency’s HK branch (which according to the memoir of Xu Jiatun, the chief at the time, was very impressed by his aspiration as the Konosuke Matsushita of Hong Kong), Au made a high-profile multi-city tour of mainland China in July 1983 which included meeting with Vice Premier Gu Mu and then Minister of Electronic Industries Jiang Zemin in Beijing. He also visited his native Fujian where Conic formed Xiamen Overseas Chinese Electronic Co (廈門華僑電子, XOCECO) as a joint venture with the local government in his native Xiamen to make TV sets. (This eventually became a listed group in the mainland known for its Prima brand of TV sets). His patriotic move was timely as overexpansion was catching up with the group and cash infusion was required to bail out the publicly traded Conic Investment, which had lent over HK$143 million to Au’s money losing Honic Group. By this time, outside shareholders such as Cheung Kong and Fidelity had lost confidence and dumped their shares. As a large employer, Conic from a social stability perspective (especially given the confidence crisis in HK at the time) was too big to fail and it possessed technology and equipment that were somewhat valuable. In June 1984, Sin King took over the management of Conic by installing China Resources’ Chow Tak-ming as chairman and injected more cash to keep the firm afloat. In 1993, Conic Investment was acquired by the state-owned China Aerospace Science & Technology Corp and was renamed China Aerospace International Holdings Limited (CASIL) with subsidiaries such as Conic Semiconductor renamed Casil Semiconductor and Cony Electronic Products renamed Casil Electronic Products while Chee Yuen’s name was kept intact and remains a major player in the plastic casing business. Today the Conic name only remains in the Conic Investment Building which was acquired in 2005 by the original developer Cheung Kong Holdings for HK$330 million. Lam Chung-kiu and Chambers Wong, the co-founders of Conic subsidiary FEU emerged from lawsuits associated with Conic in the late 1980s and built Kong Wah Holdings (港華控股, formed in 1984) into the leading TV manufacturer in HK with plants in China, Malaysia, Britain and Russia by the early 1990s, making TV sets for foreign brands such as RCA, GE, Thomson and JVC and under its own brands such as Onwa, Konka and Kawa. They sold Kong Wah to the Semi-Tech Group (whose rise and fall paralleled that of Conic) in 1995. The TV manufacturing JV which Lam established for FEU with the local government in Shenzhen back in 1980 (making it China’s first Sino-foreign electronics JV) became the Konka Group (深圳康佳), which is still a leading TV maker in China today. Alex Wong Ngok-chung (黃岳松,1952-2012) who was company secretary of Conic Investment, went on to work with Chambers Wong at Kong Wah and Tomei (Semi-Tech subsidiary) and served as CFO of Glory Mark Hi-Tech, a listed maker of computer connectivity products such as USB adapters founded by Hon Hai Precision veterans from 2000 until his death in 2012. Tony Cheung (張子東), the finance director for Conic responsible for its listing co-founded Teletech International (訊科國際), a leading local TV and telephone manufacturer, in 1982. The firm went public in 1988 and was later acquired by video cassette tape maker Swilynn International and later Grande. Rue Steel Marshall Jr (1944-) and Harry Shizuo Suzuki (1935-1997), two American engineers hired from Fairchild to start Conic Semiconductor left the firm after the mainland Chinese took over and spun off to start LCD display and PCB maker Yeebo International (億都) in 1988 with Makie Hui Po-yuen (許寶源, 1954-2010). Yeebo went public in HK in 1993 (although the founders were ousted in 1996 after fraud exposure) and remains a leading LCD maker. Ho Cheuk-fai (何焯輝, 1946-), who designed some of the popular novelty radios for Conic subsidiary Likto in the 1970s, is the co-founder (in 1980 with his wife) and chairman of Karrie International (嘉利國際), one of the world’s leading manufacturer of computer and server casings with 10% global market share. Steve Cheng (鄭衡嶽), who worked for Conic from 1978 to 1984 and was technical director of Soundic Electronics, founded the publicly listed EMS provider Telefield International (中慧國際) in 1992. Chan Kam-lit (陳金烈 1930-), Au’s childhood friend and managing director of Fengnin International (汎年國際), the HK/China distribution arm of the Conic Group formed in 1975, played a key role in the establishment of the firm’s Xiamen JV. He took over Fengnin which is now an import/export firm dealing in electronic components and plastic resins with interests in real estate projects in Fujian. Simon Wong (王幹芝, 1951-), who was deputy managing director of Conic subsidiaries Cony Electronics Products and Hung Nien and president of Cony Electronics USA became one of HK’s pioneering venture capitalists with Transpac Capital and served on the board of listed industrial companies such as Fountain Set, Hang Fung Gold and Glory Mark Hi-Tech (whose CFO Alex Wong was a Conic alum). John Chu (朱家欣), the former head of commercial production at TVB who was general manager of Conic TV Studio bought out the company which he renamed Centro TV (先濤電視, after the Italian film institute where he studied) in 1988 and founded Centro Digital Pictures, a pioneer and leader in special effects and computer animation in HK in 1987 (acquired by Deluxe Entertainment of Australia in 2012). Philip Wong (黃琿), the head of Asia for AST Computers (top five PC manufacturer in the world founded by 2 HK immigrants in California and #1 PC brand in China at one point) and later head of pioneering Asian Internet service provider Asia Online and IC design firm ValenceTech also worked for Conic early in his career. This article was first posted on 17th November 2017.